Hiroaki Hirata was born on Aug. 7 in Tokyo. His blood type is A. 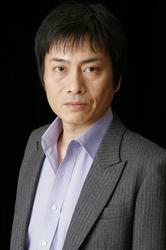 You have heard Mr. Hirata as Sanji in "One Piece", Sha Gojyo in "Saiyuki", Benny in "Black Lagoon", Genma in "Naruto", Zuikotsu from "Inuyasha", Iemon Tamiya from "Ayakashi", the Narrator of Digimon Adventure, and many more. As a member of Gekidan Subaru, a theatre company based in Tokyo, he has performed in Kanadehon Hamlet, A Christmas Carol, A Mid night summer dream, and others. Mr. Hirata is also the official Japanese dub-over artist for Johnny Depp, allowing him to provide his voice for the Pirates of the Caribbean series and Kingdom Hearts II video game.